Look at that cute little thing! I think 6 inch cakes are my favourite size cake. 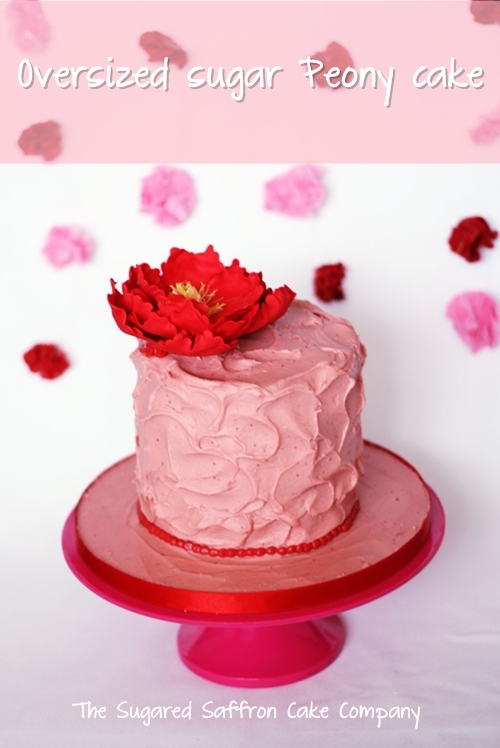 Add some pink and chocolate to the mix, and its a sure fire way to get me cakexcited (like what I did there?). This is a rich chocolate cake, filled with strawberry Italian meringue buttercream and covered in strawberry ganache. I use a white chocolate ganache for all my cakes that aren’t chocolate cakes, or that don’t have a chocolate/ganache filling. This was the first time flavouring my ganache, though I’ve thought about it in the past. I imagine dry flavours like coffee or hazelnut would be pretty easy to reproduce, but what about ‘wet’ flavours like strawberry? There are of course flavoured oils, but I wanted to go with something natural and real. I did some googling and found a few different methods of flavouring ganache. None were in much detail, but that’s the fun of experimenting. To make the strawberry ganache, I used a strawberry reduction made by cooking down fresh strawberries and straining or liquidising. I’d seen some accounts where it was mentioned to offset any liquid with more chocolate but I literally used 2 tablespoons of my strawberry reduction because the flavour’s pretty intense. Because white chocolate ganache is actually an off yellow, the resulting colour was a bit, ermm brown. So I added a teensy weensy bit of red food colouring to pinken it up a bit. I’ve wanted to do the messy iced, rustic frosting, or whatever its called for ages and this is how it ended up. I really, really love the look, and its a plus that its pretty simple to do well if you’re experienced with icing. All you need is a palette knife and a spoon. After covering the cake evenly with the ganache and a palette knife, use the back of the spoon is soft circular motions to produce the waves of icing. Do this all around the cake and its finished. I used candy melts for the border, melted and piped. The messy icing look isn’t as popular here in London as in the US, brides here are still riding the vintage train pretty hard, but I’d love to see more brides opting for it. Rustic iced wedding cakes with fresh flowers just have this appeal, and I can just imagine it at a Shoreditch wedding round the corner from me. I finished the cake off with an open oversized peony. I usually do a more closed type, with loads of layers and takes quite a while to make. This was actually finished the same day, and personally, it was a lot easier. Not a flower for the beginner I’d say, as wiring skills are needed. I searched for peony cutters in the UK and didn’t find any I liked. When I had the opportunity to get something imported from the US, I purchased the Jennifer Dontz peony cutters. I’ve already made 6 since I got them and I’m still not bored. Ok, I admit it… First time on your blog and I’m welcome by this?! You trying to kill me lady?! I’m addicted, already. Consider yourself added to my google reader. Now. I completely agree. 6″ cakes are just so cute. And more manageable as far as leftovers go! Who said anything about leftovers?! Thanks for the link, I shall be entering and following! Wow, you’ve really achieved such a gorgeous color for this ganache!